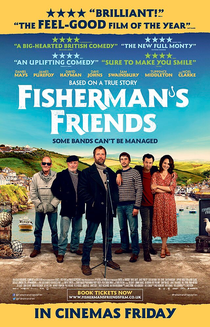 Fisherman's Friends is a light-hearted biographical comedy charting the discovery of a band of fishermen in a Cornish port who achieved success with a folk album of traditional sea shanties in 2010. The story is observed through the eyes of Danny (Daniel Mays), a cynical music executive on a Stag Party in Cornwall when he discovers the band, and is subsequently egged on by his manager to sign them to their record label as a prank. During his efforts to interest the fishermen in the record deal, he becomes enamoured by the Cornish way of life, as well as a spunky B&B owner (the daughter of one of the group). While it's easy to say that the film is derivative and a little contrived, as well as taking a lot of artistic licence with the truth, it does carry with it a certain charm and manages to whisk you away to the traditionalist settings of the Cornish coast. The cast are generally fine, although Daniel Mays lacks the charisma of a leading man and Noel Clarke seems to be doing his own thing as the makeshift villain of the story. The best performance belongs to Tuppence Middleton as the love interest, since the romance could have felt incredibly forced were it not for her good work. The music may be old-fashioned, but it has a modern spin and performed with passion and gusto which gives it a unique sound in the 21st Century and perfectly sums up the traditionalism vs commercialism plot points of the story as a whole. Unlikely to be on anyone's list of the best films of the year, but it's easy-going, non-offensive fun.